SIGN UP NOW for free weekly motivation! What challenges does Douglas address? "We try to be innovative, but my team seems to be stuck doing things the way they've always been done. The way you phrased it in your keynote was: 'They carry the old gods with them.' That's us." See Douglas's latest videos or visit the Video Gallery under Media Centre to view the entire archive. Douglas is the author of 6 business books, including the highly acclaimed 'Own Your Industry - How to Position Yourself as an Expert,' with Penguin Random House. A multiple award-winning speaker, his clients include senior management at companies like MultiChoice, BMW, Liberty and HP. In 2015, Liberty and MultiChoice booked him for their multi-city roadshows. Douglas’s results were so exceptional that in 2016, both organisations insisted on using him again. 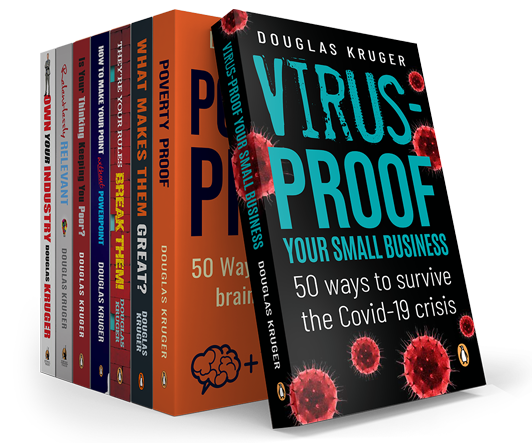 Douglas Kruger CSP is a published business author with Penguin Random House. His books include: 'Own Your Industry - How to Position Yourself as an Expert', 'Relentlessly Relevant - 50 Ways to Innovate', 'How to Make Your Point Without PowerPoint', and 'Is Your Thinking Keeping You Poor? 50 Ways the Rich Think Differently'. Douglas's latest book is titled 'They're Your Rules, Break Them! 50 Ways to Smash Silos, Bust Bureaucracy and Create a High-Performance Culture'. Douglas’s books are available globally in audio format too, read by the author. And for more valuable ideas, scroll to the media tab and read his free articles, or sign up for his free motivational newsletter, ‘From Amateur to Expert,’ below. Douglas Kruger CSP is the business author of 7 books and an international speaker. For true breakthrough thinking and outstanding insights into the levers behind real business innovation, choose one of South Africa's premiere professional speakers. Please click on either options below to read more. We are not wired to receive passively. We are wired to create and to grow meaningfully. Earning your own way is not a hardship. It is an honour. It is your opportunity to become. Douglas is phenomenal. He has great expertise, is very result oriented, and also knows what it takes for organizations and people to change. He has been very valuable to us. You added so much value to the conference and you have at least another 200 followers after your presentation! You have exceeded my expectations and you can seriously put up your fee, you are definitely in a different league. Douglas Kruger CSP, professional speaker, author and trainer, has spoken at many organisations, managing minds and growing their potential. This is what some of those clients had to say. "From conceptualisation to conclusion, Douglas was a consummate professional. His address was incredibly well aligned with the spirit, content and conversations of our senior leadership team and he was charming, funny and insightful. He left the executive with a set of very practical, immediately implementable, next steps. An intellectual and strategic storytelling delight." "Once again thank you for your input with my speech. For me that was somewhat of a defining moment and like the foreword in one of your books, I am grateful for the time that you (the famous one here) so readily invested in me! Take care Doug." "Douglas taught Mensa a thing or two. Thanks once again for the talk, we are getting very positive feedback from our members on both the talk and your books!" How to move from amateur to expert - Douglas's weekly tips. Subscribe below! Thank You ! Your subscription has been received. If a growth principle in one of Douglas's articles appealed to you, why not have him make it come alive for your staff? Douglas Kruger CSP is a member of Toastmasters International and The Professional Speakers Association of South Africa. Book Douglas Kruger CSP to present for your team or at your next conference. BOOK DOUGLAS to present for your leadership team. Book Douglas Kruger CSP for your company today!